Most people with Czech heritage do not use FamilySearch Family Tree to organize their genealogy. There are lots of varied, logical reasons for why people might use other platforms (which wasn’t the point of this post, so don’t let me get sidetracked! ), and truthfully, I deeply understand and agree with a lot of these reasons. And actually, I have a goal to put my research on Geni and Ancestry.com before the end of the year (but I thought I was not supposed to get sidetracked…). As an LDS person, of course FamilySearch Family Tree is my first tool of choice. FSFT is a genealogy tree for the entire world, which everybody can see and edit, and which is the platform for LDS people to prepare ordinance work. Basically, little cards with barcodes that you can scan inside the temple. Because time is limited, FSFT has been my go-to choice for a lineage linked software (I should probably have a back-up somewhere…but I don’t). I do not use it as a working research notebook because it is a public tree for the entire world, and I prefer to only share information that I know (or “know” – since, like science, anything in genealogy remains under some degree of doubt) to be true. I keep a research log in google docs, and once I am reasonably confident in my findings, I input them into FSFT. 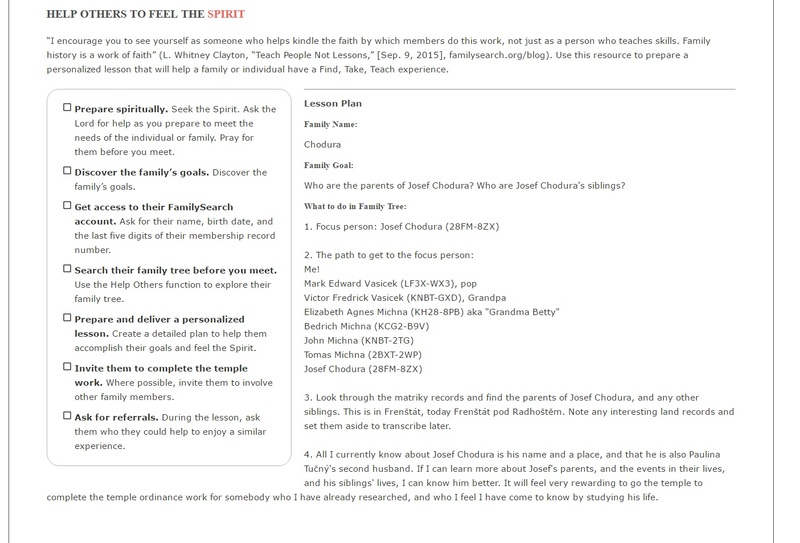 You may or may not know that I am also a “Temple and Family History Consultant” in my ward. Technically, I am the TFHC Coordinator. I coordinate the consultants, so that we can serve all the patrons in our ward – or really, even those who are not in our ward. Our job is to serve and help people who need help with family history, including our friends, neighbors, and distant online cousins! FamilySearch recently (like…2 weeks ago) came out with a really nice new tool to help us do that. I decided to make a short tutorial on how to use it, since there is almost nothing on the Interwebs about it yet. 2. Click “Yes, I’d Like Help”. A new window will open in your browser. 3. Give your TFHC permission to access your FamilySearch account. Kind of funny to be giving myself permission, haha. 4. Congratulations! Now your TFHC can access your spot on the tree much more efficiently and effectively. Based on the information in FamilySearch, your TFHC can see information about your ancestors and about what needs to be done next, at a glance. Very purdy. 6. The TFHC wants to help this patron, so they decide to navigate to this spot in the tree (where I happen to have been researching). Notice the little green bar on the side of the page. Any edits that I make in this view will be as if they were made by the patron themselves. 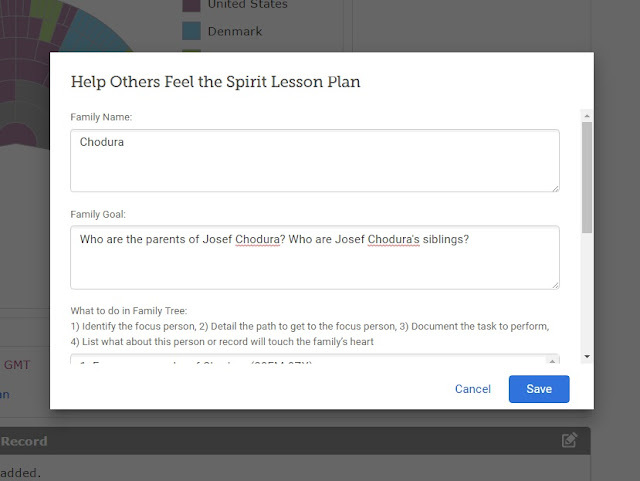 My next step in this research is to try to find the parents of Josef Chodura. 8. Here is a link to the lesson plan created by the TFHC. 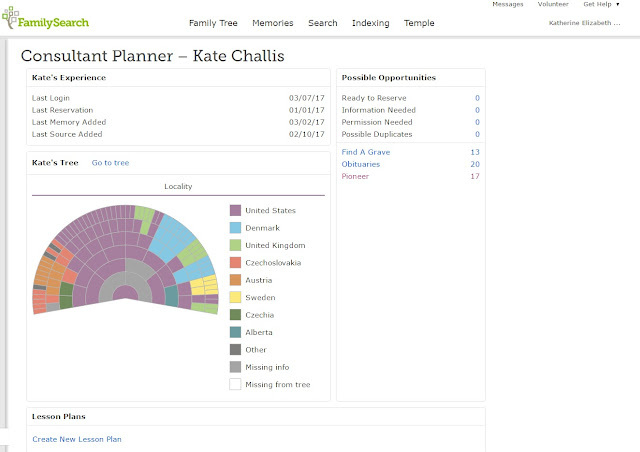 I suggested to FamilySearch that they enable an option for automatic email updates when the plan is created/changed. Until that option exists, I will both print the plan for my patrons, as well as email them the link to this page. Seriously, we can meet “virtually” if that makes life easier. It makes my life easier, to be able serve you from my home office. We can discuss the plan. TFHC’s can change the plan, and write notes about consultations. Honestly, this is just a consolidated and prettier version of my Family History Consultation tracking which I have been doing in google docs. This is a lot nicer. 10. Follow the plan, rinse, repeat. Your TFHC will log changes using this tool. Everybody will be happy. 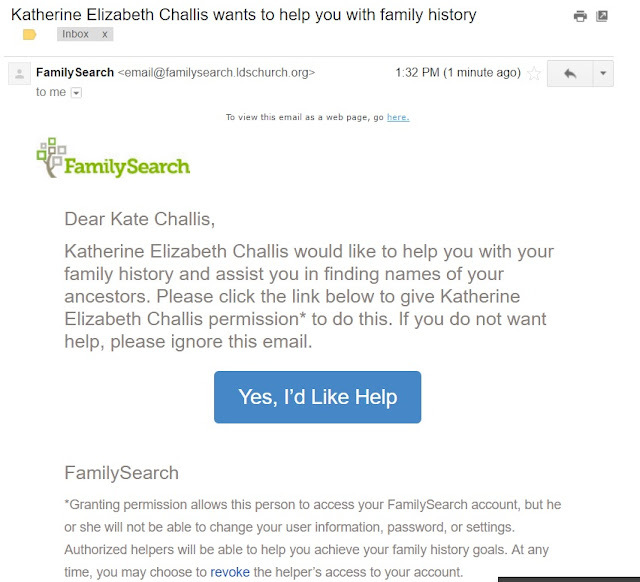 You don’t have to work on your genealogical goals alone! I encourage everyone to get on FamilySearch Family Tree. 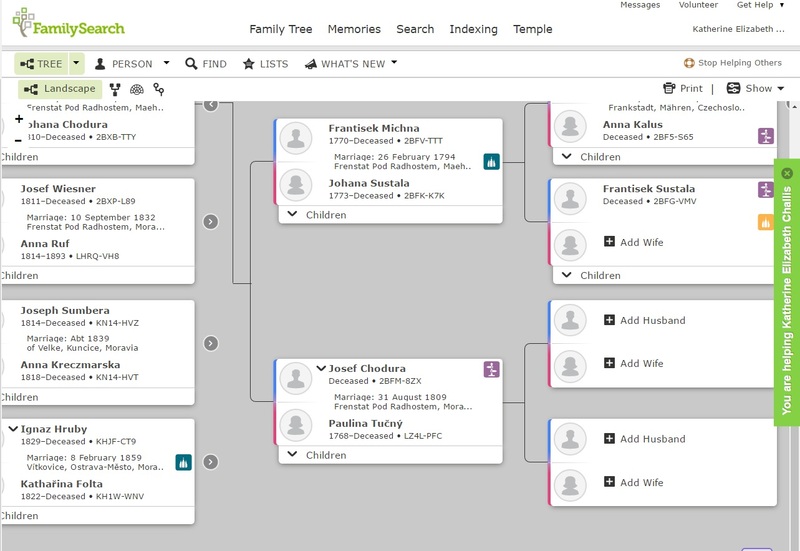 No matter what your purpose for doing genealogy, we can work together and collaborate on our genealogical efforts and create the most accurate, most complete picture of our past possible. In this post, I showed you one tiny glimpse of how I can help you do that with this new tool, but there are many, many other ways that FSFT encourages collaboration and communication. Please give it a try!